* Pocket Quran for Java-enabled Phones v0.97b (requires MIDP 2.0 support) -- The complete Holy Quran in Arabic for Java-enabled phones. Includes verse number and division markers. With search capability & touch screen support (where available)! * Pocket Quran for Android devices v0.91b (requires Android 1.1+ or later) -- The complete Holy Quran in Arabic for Android devices. Very lightweight. Optimized for high-speed browsing. Featuring ultra-fast search & multiple bookmarks support. * Pocket Quran for Blackberry devices v0.97b (requires Blackberry OS 3.8+ or later) -- The complete Holy Quran in Arabic for Blackberry devices. Includes verse number and division markers. With search capability & touch screen support (where available)! * Palm Quran v0.98.5b The complete Holy Quran in Arabic on the Palm Pilot for FREE. Palm Quran runs natively on Palm OS 3.5+ and does not require Arabic support or extensions. The text has full "Tashkeel" and is displayed using large, easily readable letters. Fast scrolling and display. Includes verse numbers and search capabilities. * Pocket Quran v0.97b for Pocket PC (beta version). 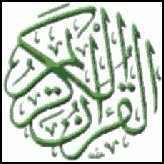 The complete Holy Quran in Arabic for Pocket PCs for FREE. Pocket Quran runs natively on Pocket PC 2000+. The text has full "Tashkeel" and is displayed using large, easily readable letters. Fast scrolling and display. Includes verse numbers and search capabilities. * Pocket Quran v0.95b for MS Smartphone 2002 (or later) The complete Holy Quran in Arabic for Smartphone 2002 for FREE. Pocket Quran runs natively on MS Smartphone 2002. The text has full "Tashkeel" and is displayed using large, easily readable letters. Fast scrolling and display. Includes verse numbers. * Pocket Quran for Nokia Series 60v3 - like Nokia N and E series (N80, E62, ...) and similar devices. v0.96.2b. The complete Holy Quran in Arabic for Nokia Series 60v3 for FREE. Pocket Quran runs natively on Symbian OS and does not require Arabic support. The text has full "Tashkeel". Includes verse numbers, division markers, and search capabilities! Must have a phone with medium or hi-resolution screen. NOTE: this version is outdated! It is recommended to install the J2ME version instead! * Pocket Quran for Nokia Series 60v1 (versions 1 and 2) like 6600 and similar devices. v0.96b. 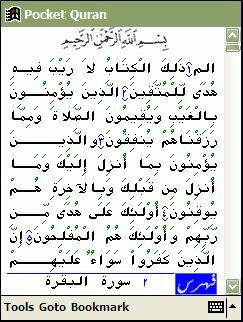 The complete Holy Quran in Arabic for Nokia Series 60 (v1 and v2) for FREE. Pocket Quran runs natively on Symbian OS and does not require Arabic support. The text has full "Tashkeel". Includes verse numbers, division markers, and search capabilities! * Pocket Quran for Nokia 9500 and 9300 series v0.96.1b The complete Holy Quran in Arabic for Nokia Series 9300 and 9500 for FREE. With search capabilities! * Pocket Quran for UIQ2 devices (like Sony Ericsson P900) v0.96b The complete Holy Quran in Arabic for UIQ2 (P800, P900 and above) for FREE. With search capabilities! NOTE: does not work on UIQ3 devices. Use "Pocket Quran for Java-enabled Phones" above for UIQ3 devices. * Pocket Quran for Series 90 (Nokia 7710 & compatibles) v0.97b -- The complete Holy Quran in Arabic for Series 90 (like Nokia 7710) for FREE, with search capabilities. * Onhand Quran v0.6 -- the complete Quran in Arabic for Onhand or Ruputer watches.